When you move into a new home, there are a lot of items that you need to go out and purchase, and shopping can become a bit confusing. This shopping list template for new house can make things simple and easy for you, allowing you to shop with ease. 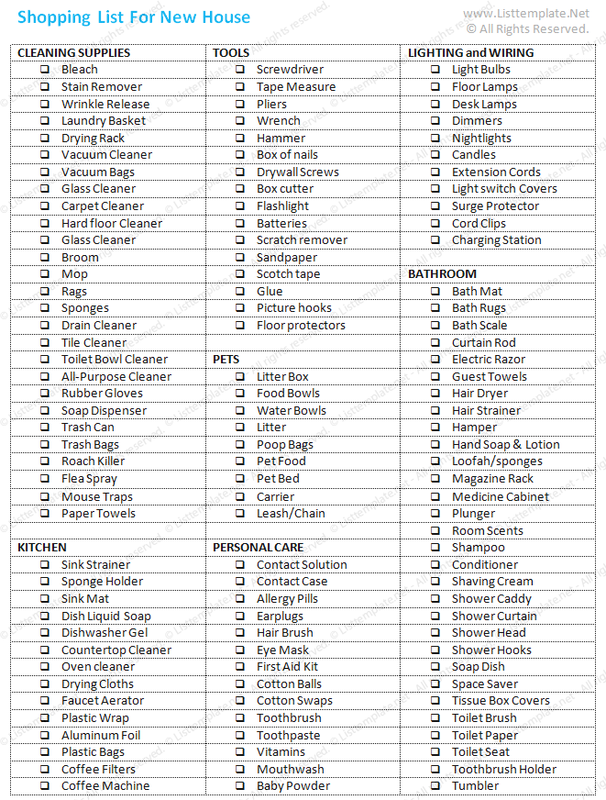 This shopping list template includes items that are sorted into categories, making it easy to shop for all of the items that you need for your new home. The categories include food, cooking gear, supplies, and more. Each of the items on the list includes a box that can be checked when the item is purchased, so that you can easily track which items you have purchased and which you still need to pick up. Created in Microsoft Word®, this template is very simple and professional, allowing you to fill your home with all of the items that you need to make it comfortable, safe, and ready for use.